Live today – die tomorrow! The opener of the new album of Hamburg-based Glam-Goth-shooting-stars Lord Of The Lost is like a battle cry that runs like a thread through all the new songs: honest, direct, energy-laden, prone to experimentation, raw and as catchy as never before! Vocal acrobat Chris “The Lord” Harms and his lads are performing their new material as if there is no tomorrow while unleashing all of the verve that makes them an unrivaled live act in a collection of tunes that defy conventions. 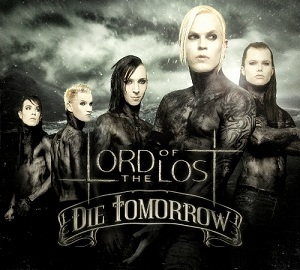 On 'Die Tomorrow', Death Metal flirts with Disco, Industrial with Electronica, Goth with Pop, only to culminate in a Art-Rock-esque grand finale, while fusing this diversity of styles like it is the most natural thing in the world. In the middle of all this mayhem, Chris Harms delivers one of the most spine-tingling duets of the last years with Blutengel’s Ulrike Goldmann, in a grandiose song co-written with Martin Engler from Mono Inc. 'Pigeonholing is for beginners' seems to have been the motto… fact is that Lord Of The Lost have managed to create one of the most interesting and entertaining albums to come out of the dark Rock- and Metal-scene in years. 'Die Tomorrow' will also be released as a limited double-CD in a Digipak. The bonus disc contains not only an epic 20-minute song but also energetic collaborations with Alex Wesselsky (Eisbrecher) and Erk Aicrag (Rabia Sorda, Hocico).